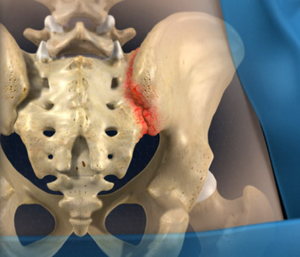 A sacroiliac joint injection is an injection of an anesthetic with a long lasting steroid (“cortisone”) in the Sacroiliac joint(s). The sacroiliac joints are located in the back where the lumbosacral spine joins the pelvis. They are paired (right and left) and are surrounded by a joint capsule like the finger joints. The steroid injected reduces the inflammation in the joint space. This can reduce pain, and other symptoms caused by inflammation. The procedure is performed with the patient lying on their stomach with fluoroscopic (x-ray) guidance. The patients are monitored with EKG, blood pressure cuff and blood oxygen-monitored device. The skin in the back is cleaned with antiseptic solution and then the injection is carried out. After the injection, you are placed on your back or on your side. The immediate effect is usually from the local anesthetic injected. This wears off in a few hours. The cortisone starts working in about 5 to 7 days and its effect can last for several days to many months.